Margao being very close to the Arabian Sea and just 273 miles away from the Mumbai is favoured by a pleasant and cool climate. 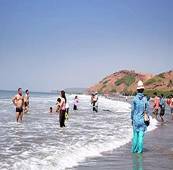 This place is located in the Southern region of Goa with its neighboring regions as Ponda, Mapusa, Vasco-da-Gama and Panaji.It also shares the head office of Goa for the southern region. Margao has the right of ostentatious display because of its rich history.Margao being one of the oldest cities of Goa was in light even before independence and was also reffered as the temple town of the country for it was the place known for its indefinitely numerous temples. It was only after the settlement of Portuguese in this area they started destroying the Hindu temples and built number of churches thus propagating Christianity. which is celebrated for nearly four days falls in the month of February/March is known for its colourful processions, floats and dance at Margao. which is celebrated here as Shigmotsav takes place for nearly a week which is highlighted by parades with colourful floats with mythological themes and they are as processions into the town. which is a festival to celebrate and glorify Lord Ganesha is celebrated here with great rejoice during which people return to their ancestral homes and the little villages and towns hum with excitements, as various ceremonies are observed. The universal festival of India is also celebrated here in Margao during which an imitative figure of Narkasur is burnt. which falls in the month of May has people coming from all over Goa to celebrate with joy and enthusiasm. Feasting and celebration takes place in a large scale all over Margao. The anniversary of Jesus' death on the cross is observed as Good Friday which usually falls on the last Friday before Easter. It is the pinnacle of Holy Week, and Margao Christians observe this day with great humility and reverence and the houses and churches are beautifully decorated. The most popular festival in Goa and the state looks like a little paradise that is decorated in shades of red, green and white of gleaming streamers. Celebrated every year on the 3rd December, marking the death anniversary of this revered saint. St. Xavier who came to Goa along with the Portuguese to propagate the teachings of Christianity to people. Major feasts are organized in the honor of this saint on this festival. one of the common Hindu festivals celebrated here in Goa during which the ladies clean up the old dolls and give it to their daughters and buy new dolls for the golu padi which consists of wooden boxes arranged in steps. This elaborate conceptual structure of an imposing appearance situated in Margao in Salcete Taluk is a fine examples of Indian Baroque style of architecture. The present church was rebuilt in 1645 from the original one which was built in 1564.The heavily decorated altars are dedicated to Immaculate Conception of Mary, St Peter and St. Michael. 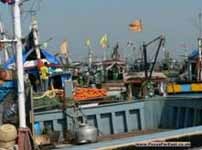 It is located at a distance of about 33kms away from Panaji. Shri Mallikarjuna temple belongs to the 16th century and is situated in Canacona at a distance of about 40 kms. from Margao.Dedicated to Lord Mallikarjun, an incarnation of Lord Shiva, the temple is renowned for its colorful annual festival (jatra) in which the idol of the deity is taken out in a procession to the nearby Kindlebag beach and is bathed accompanied by other rituals. The added attraction to this temple is the carved wooden pillars depicting scenes from the Puranas and Mahabharatha. The highlight of this temple is the interior decoration of it which is done in white marble and also its location with a backdrop of a beautiful hillock covered with dense groves of areca palms.Datta Jayanti is a prominent festival celebrated here in December. 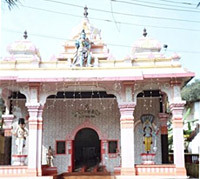 This mandir is located at a distance of about 40 kms. from Margao. Jama Masjid which is known for its discriminating beauty and pretentious style is situated in Sanguem taluk about 26kms from Margao.A dome arises in the center of the mosque and it has four minarets at its entrance, flanked by two towers surmounted by pillared kiosks. This park is named after a businessman, Abdul Javerbhai Mavany who plays a key role in developing a major portion of this garden as a gratitude to his lost sons. The park was inaugurated by Goa"s last Portuguese Governor General, Vassalo e Silva, in 1959. The famous "House of Seven Gables" or "Sat Burzam Ghor" is a magnificent mansion was commissioned in 1790 by Sebastino da Silva, emissary and private secretary of the Portuguese Viceroy.There are only 3 gables exist now. This is a small beach side village at a distance of about 9 kilometers from the port town of Vasco da Gama. This place situated in a small bay, with around a mile of curving sandy beach is a very peaceful area to relax and it also caters various range of accommodation and places to eat. 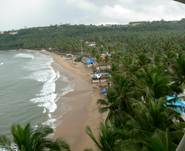 It almost extends half way along Goa's coast. This beach's spectacle of sea, sand and sky blend in an enchanting natural harmony, weaving their magic spell on the visitors. Known for its scenic beauty. This is part of Salcete, Goa's only Catholic majority sub-district. Though once it was a very calm area now it is being buzzed by tourists. Vasco da Gama is a small city in Goa state on the west coast of India. It is named after the Portuguese explorer Vasco da Gama. The people from Vasco love fun and music.Vasco is also famous as the abode of Goa's toddy tappers, Vialli (locally known as Render), holds the world record for staying in a coconut tree for almost two years. The Largo de Igreja, or the Church of the Holy Spirit as it is also known, dominates the entrance to the city, just north of the Municipal Garden square. 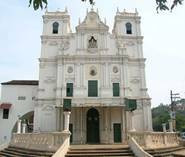 The church was built by the Portuguese in 1675 and is one of the finest examples of late-Baroque architecture in Goa, boasting a pristine white fade and an interior dripping with gilt crystal and stucco. People visiting Margao can have a boisterously carefree and swaggering shopping here in this place for it is known for its indigenous artifacts and souvenirs. There are also big shopping plazas and malls. People get entranced by the variety of artifacts like crochet work, carved furniture, shell work, bamboo work, brassware, curios and old coins, trinkets etc.Goa Handicrafts Industries Development Corporation emporium in Margao is another source of artifacts and handloom materials. The main shopping area extends from south edge of the main square to the old railway station. The beachside shopping is concentrated more in the Colva beach. Goa has one airport at Dabolim in Vasco. Some airlines fly directly to Goa, but most international flights arrive via Mumbai. Many domestic airlines have daily flights to and from Bangalore, Delhi, Hyderabad, Mumbai, Pune, Chennai, Jaipur, and Ahmedabad. Kadamba Bus Stand, 3 km away on the outskirts of the town is the main bust station of the region where buses from Colva, Panjim and Vasco arrive.